Gfest: NYCC 10: DC Announces FLASHPOINT as Next Big Event. What is It? 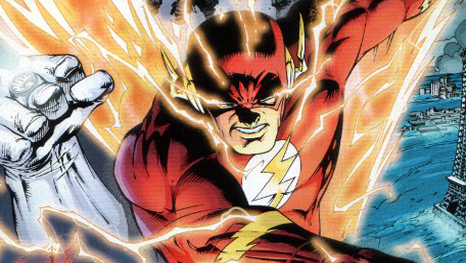 NYCC 10: DC Announces FLASHPOINT as Next Big Event. What is It? After the announcement at NYCC 2010 that the next big Mega event for DC would be Flashpoint, I decided to do some research to determine what is Flashpoint? 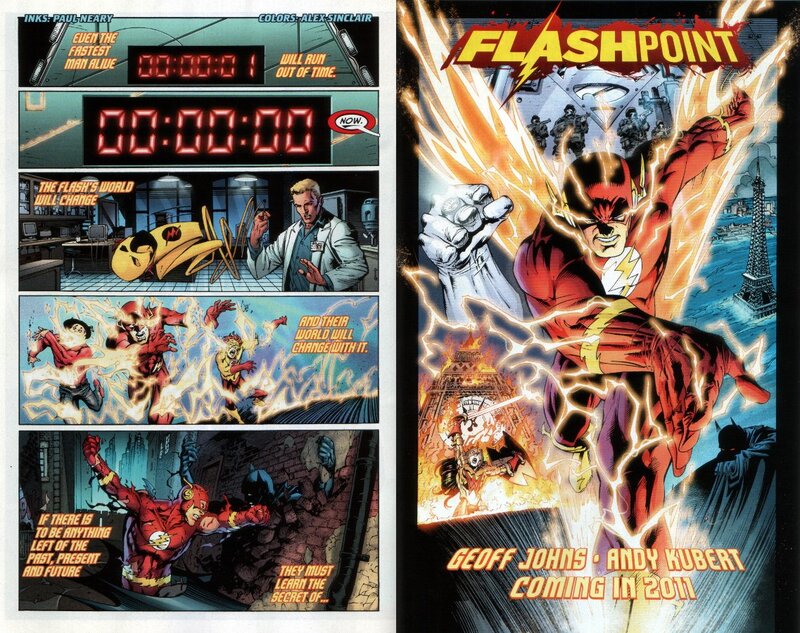 If you recall DC and Geoff Johns teased us with a new series called Flashpoint in the first issue of The Flash. After researching and reading numerous references to Flashpoint, I came across a post by Joey Esposito at Craveonline. Joey does a wonderful job of breaking down the teaser images for Flashpoint in the Flash #1 and analyzing other references to from DCU's history to form a hypothesis on DC's next big event. So panel for panel, the first two are pretty obvious. Clock counting down. But the third panel is where things get interesting, with the Reverse-Flash costume coming out from Barry Allen's ring, where his usual scarlet costume is kept. Judging by the surprise on Barry's face, this is an unexpected occurrence. What's intriguing is the recent re-emergence of Eobard Thawne in The Flash: Rebirth, where we discover that Professor Zoom has been orchestrating Barry's life since childhood, from the death of his mother to his "resurrection" from the Speed Force. Next up is Jay Garrick, Wally West and Bart Allen getting themselves rocked by the Speed Force, shades of Barry Allen back in Crisis on Infinite Earths. Combined with the panel above it, I think it's safe to say that some external force is messing with the Flashes, and perhaps even the Speed Force itself. So, just what the hell could this all mean? Well, one important thing to note is a little series called... Flashpoint. 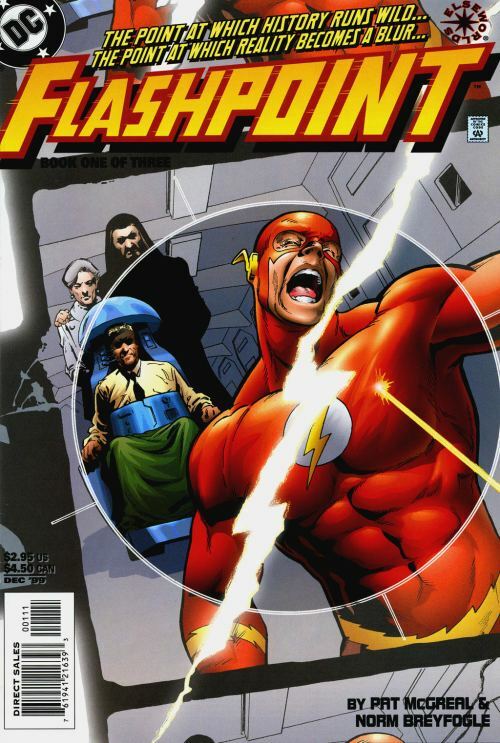 In 1999, DC Comics released an Elseworlds story by the same name, which focused on a concept that involved Wally West uncovering the titular Flashpoint, which was a device that could be an entry into the Speed Force, let alone other realities. Of course Vandal Savage tries to overtake the device for his own purposes, including but not limited to a weird plot revolving around the JFK assassination. The reason that's relevant is a few words from this teaser: "if there is to be anything left of the past, present, and future, they must learn the secret of the Flashpont." Could this Flashpoint be the same concept? 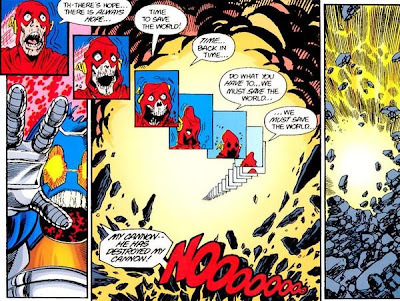 In the Elseworlds tale, Barry Allen has dreams that represent other realities that can be accessed through the Flashpoint, including the DC Universe. Could our DCU be looking at a battle through time and across realities through this concept that was added to the DC lexicon some ten years ago? Geoff Johns has brought Elseworlds into the main DCU before. Kingdom Come Superman anyone? The man is a master of dredging up DC history and making it new. Johns has also used this same build up in another title of his. You know, that Green Lantern book. Both titles, thus far, have begun with Rebirth mini-series that lead directly into a brand new monthly ongoing, with a tease for a big story featuring said character. How do we know that in 6 years we won't look back on The Flash: Rebirth realizing all of the little plot points Johns had set up, like we are doing today with Green Lantern: Rebirth? Every incarnation of the Big Three shown in the teaser isn't their natural state. A vampire Batman, war mongering Wonder Woman and militaristic Superman are all great fodder for an Elseworlds story or alternate Earth, some of which we've already seen. Could these twisted versions of our beloved DCU heroes be using the Flashpoint to invade our world, city by city? Brightest Day, The Return of Bruce Wayne and Rip Hunter: Time Master all point to a renewed importance in the timestream aspect of the DCU. DC went so far as to say that Rip Hunter would have some clues implanted in it that lead right to DC's next big event. Thanks to Joey and Craveonline for this wonderful theory on DC's next big thing, Flashpoint. What do you think Flashpoint is all about? Do you even care about it? Do you think rises to the level of a mega event? Let us know?